On Saturday, September 22, Her Majesty the Queen will open the new Stedelijk. Beginning Sunday, September 23, the museum will be open to the public again. With a brand new wing, the Stedelijk now has more space than ever to show its famous collection and its renowned and influential exhibitions. In the opening week, the museum is also open on Monday September 24! 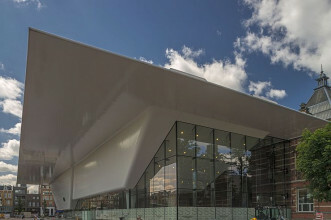 A complete renovation of the Stedelijk’s historic building, designed by A.W. Weissman and dating back to 1895, has converted virtually all of its program spaces into galleries, enabling the first comprehensive display the Stedelijk has ever mounted of its permanent collection, widely acknowledged to be among the world’s most important collections of modern and contemporary art and design. The dynamic new building—designed by Mels Crouwel of Benthem Crouwel Architects and measuring 10,000 square meters (98,400 square feet)—will provide new space for the Stedelijk’s renowned and influential temporary exhibitions, as well as a host of new amenities. The innovative design also re-orients the entire museum to face onto Amsterdam’s Museumplein (Museum Plaza), activating a vital public space that is shared by the Stedelijk and its neighbors: the Rijksmuseum, the Van Gogh Museum and the Concertgebouw. The museum also announced details of the permanent collection installation and of two inaugural temporary exhibitions. Beyond Imagination will feature new projects and commissioned works by an invited group of 20 artists, both Dutch and foreign-born, now active in the Netherlands. It will be installed in the new second-floor galleries and spill out into the auditorium and public spaces in the new building. The first temporary exhibition in the new building’s 1,100-square-meter (10,800-square-foot) gallery will take full advantage of this unique space by presenting large-scale contemporary works and installations from the collection by Carl Andre, Rodney Graham, Joan Jonas, John Knight, Barbara Kruger, Melvin Moti and Diana Thater, among others. This vast, column-free, open-plan gallery brings exciting new possibilities for monumentally scaled works to be presented indoors in Amsterdam. The Stedelijk will proceed with its plans for the eagerly anticipated retrospective 'Mike Kelley'. The exhibition will open at the Stedelijk on December 15, 2012, and then travel to other major museums in Europe and America. The renovation and new wing of the Stedelijk Museum Amsterdam were made possible thanks to the generous support of the Founders and Donors of the Stichting Fondsenwerving en -beheer Uitbreiding en Renovatie Stedelijk Museum and the Stichting Stedelijk Museum Amsterdam.